This year, the Maryland Cybersecurity Center (MC2) and the National CyberWatch Center K-12 Division hosted three summer camps for students interested in the field of cybersecurity: the Cyber Defense Training Camp, the Intermediate CyberSTEM camp, and the CyberSTEM camp. Each camp included hands-on activities designed to encourage students to gain confidence in their cybersecurity knowledge, with an emphasis on skill-building and interactive learning. The Cyber Defense Training Camp for rising high school juniors and seniors is a seven day, residential camp offered at the University of Maryland. This year’s 30 camp participants from across the country learned new skill sets in a variety of cybersecurity topics, such as cracking passwords, changing public IP addresses, and creating and analyzing malware. 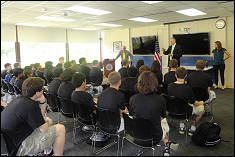 Students visited the National Security Agency’s Cryptologic Museum and Northrup Grumman, exposing them to the many opportunities available in cybersecurity in Maryland. Additionally, students learned about the Advanced Cybersecurity Experience for Students (ACES) program, a unique cybersecurity honors program available at the University of Maryland. In all three camps, participants enjoyed interacting with ACES students who served as camp counselors, teaching assistants, and volunteers for team building activities. Both the Intermediate CyberSTEM Camp and CyberSTEM camps introduced young women interested in the field to hands-on activities in programming, cryptography, and forensics. These two five day commuter programs are designed specifically to encourage middle and high school girls to pursue cybersecurity and Science Technology Engineering and Math (STEM) fields. At the end of the program, students showcased games and animations they created and made presentations about a variety of internet safety topics. Camp attendees heard from various guest speakers throughout the camp who shared their stories and insights with the students. This year’s guest speakers included Amy Ginther, Project NEThics Coordinator at the University of Maryland; Charalampos Papamanthou, Assistant Professor in the Department of Electrical and Computer Engineering and the University of Maryland Institute for Advanced Computer Studies; Mark Danner, a Consulting Manager with National Strategies, LLC; and various female professionals from Northrup Grumman, including Anastasia Reitz and Terra Bjorling. The Maryland Cybersecurity Center partners with government and industry to provide educational programs to prepare the future cybersecurity workforce, and develop new, innovative technologies to defend against cybersecurity attacks. For more information about our camps and workshops, please visit our website: www.cyber.umd.edu/education. For questions, please contact Ashlyn Vander Woude at avwoude@umiacs.umd.edu.